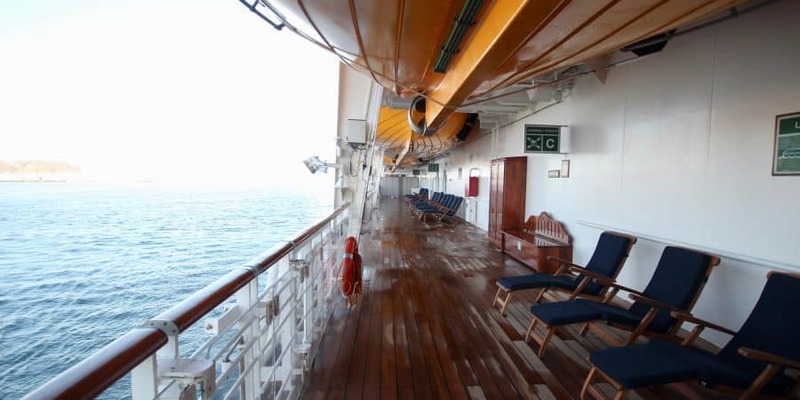 Many cruise lines have special, secret staterooms, Disney Cruise Line is no exception. The Disney Magic and the Disney Wonder have 2 sets of these rooms: secret porthole staterooms, and secret verandah staterooms. The secret porthole staterooms have an obstructed view and their category was changed from a 9A to a 10A. To book these rooms you’ll want to look for a Deluxe Inside Room, rather than an Oceanview Room. We have been lucky enough to stay in the secret porthole stateroom twice. Once on the Magic and on the Wonder. 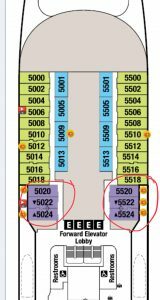 The stateroom 5520 is conveniently located on deck five, four decks down from the pool deck and one or two decks up from the restaurants. It is on the same floor as the Oceaneer’s Lab and Club, as well as the movie theatre. We love the location of the room and we are lucky enough to be booked again in 2019. The only downside to this room—other than it can be difficult to book—is you can hear noise coming from the Walt Disney Theatre below during shows and some rehearsals. 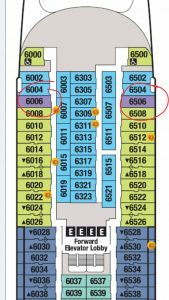 DCL recently added two new rooms 6006 and 6506 to the secret porthole category. They are one floor up which would prevent the noise from the theatre, but are more forward, so you may feel more motion in those rooms. What is your favourite stateroom to stay in?